The title of this post might take you back to “No. 1… THE LARCH” (followed by “No. 3… THE LARCH!” and “…now for something completely different…”). This might have been the most obscure of Monty Python’s many recurring non-sequiturs, and it is indelibly imprinted in the minds of among those of us of a certain age… but the Pythons had it right: the larch isa remarkable tree, and it really can be “recognized from quite a long way away”. At about this time each fall, Oregon’s only deciduous conifer explodes into shades of bright yellow, gold and orange before dropping its needles for the winter. Western larch (Larix occidentals) spends most of the spring and summer growing season blending in with other conifers in the forest, and are thus easily missed. But for the next few weeks, they will be flamboyantly on display, and are worth a visit to the east side forests they call home. Western larch is one of about a dozen larch found around the world, but it is the only larch found in Oregon. Its range extends north to British Columbia and east to Idaho, Montana and Alberta. It’s also among the largest of the larch species, capable of growing nearly 200 feet tall on massive trunks up to five feet across. Our Western larch is often called “tamarack” by locals, but that name actually belongs to a different, smaller species that grows in the eastern part of the continent. Western larch has a distinctive shape compared to other forest conifers. Its crown is narrow and tapered, like a candle, and it often grows in groves were its shape allows closely spaced trees to thrive. Larch trees can survive extreme cold and thrive in subalpine forests with winters are frigid and summers are hot and dry — exactly the climate found on the east slopes of Mount Hood. Here, Western larch often dominates the forests and form the westernmost reach of the species. Western larch is also prolific in producing offspring, with thickets of young larch growing among the big trees, especially after fire or logging. Young trees are fast-growing, often adding a foot or more of new growth each year. The branches of Western larch are unique and easy to spot, even during its “green” phase in spring and summer. New growth emerges bright yellow-green in spring from rows of knobs along its limbs, with clusters of needles held in tufts that emerge from each knob. This gives the foliage a delicate, lacy appearance during the growing season, when its foliage gradually deepens to dark green. Their bare limbs have distinctive, gnarled, picturesque shape in winter, when the needles have dropped. The cones of Western larch are small, and also arranged among the small knobs that dot its limbs. Mount Hood’s east side forests are also “fire forests”, ecosystems where frequent fires are essential to forest health. Like the neighboring Ponderosa pine that it typically associates with, Western larch has thick bark designed to protect mature trees from repeated fires. For added fire protection, larch drop their lower limbs at the tree mature, keeping the growing tree canopy high and out of reach of fires sweeping through the understory. But in the recent catastrophic fires that have swept through the east and north slopes of Mount Hood, the flames were intense enough to reach larch canopies, killing thousands of these normally fire resistant trees. Despite this, young larch seedlings are among the most prominent trees leading the forest recovery in the aftermath of the Bluegrass Fire (2006), Gnarl Fire (2008) and Dollar Lake Fire (2011) that burned most of Mount Hood’s eastern and northern flanks. Western Larch shed their lower limbs, keeping their growing crowns out of reach of low-intensity fire that would likely burn the other, low-branched conifers in this forest near Hood River Meadows. Western larch can live to be at least 1,000 years old — that’s the age of “Gus”, the largest and oldest larch of any species in the world. Gus is a Western larch [link=https://crownofthecontinent.natgeotourism.com/content/gus-worlds-largest-larch-tree/cot50caf093bd65f401b]growing in a grove of ancient larch survivors[/link]in Montana, and is at the heart of a magnificent larch grove that should be on every big tree hunter’s “bucket list”. Mount Hood’s most venerable Western larch might be the stunted patriarch growing from a high rock outcrop along Surveyors Ridge (below) at a spot I call Tamarack Rock (an explanation for that improper name is found in this 2009 blog article), where it enjoys a magnificent view of Mount Hood, but also endures the brunt of Pacific storms sweeping across the Cascades in winter and intense heat and drought over the summer months. This old tree is likely centuries old, and has survived fires, logging and undoubtedly a few lightning strikes is this exposed location. Like most of our native species, the Western larch was used by Native Americans for food and materials. The resin under its bark was used for medicinal purposes and larch wood was used for poles and as firewood. Today, it is still prized as exceptional firewood. Which brings us to perhaps the most unfortunate threat to Western larch in our increasingly busy forests: being cut down as “dead” during its dormant, leafless winter phase. Too many perfectly healthy larch trees meet this completely avoidable fate in our forests and cities each year. These oddly shaped larch near Brooks Meadow have been attacked by the Larch casebearer, an introduced European moth that can defoliate and even kill Western larch. A more worrisome threat is the Larch casebearer, a European insect that can defoliate Western larch. The parasites that keep the casebearer in check in Europe has not been effective as an introduced counter measure in the Western larch range, and the long-term impact of this introduced bug on our larch stands is still unknown. The photo above looks like it might be a larch grove in fall, but the photo was taken along the Lookout Mountain Road in mid-summer, showing the crowns of several Western larch under heavy attack by the Larch casebearer. The State of Oregon has published this fact sheet with more information on the casebearer. From now through early November, Western larch will be putting on a show along the eastern leg of the Mount Hood Loop Highway, where OR 35 follows the East Fork of the Hood River to Bennett Pass. Bennett Pass roughly marks the dividing line for its range, with big stands of larch suddenly appearing east of the pass. If you have more time, the Dufur Mill Road (Forest Road 44) has still more Western larch on display, including along the unimproved road to High Prairie on Lookout Mountain. And if you simply travel Highway 26 across the Cascades, you’ll see Western larch from Blue Box Pass east to the edge of the forest. If you’re looking for a trail to hike or ride a bike through larch stands, the Dog River Trail (No. 675) and Zigzag Trail (No. 678) are good choices. Both are quiet, though you’ll share the Dog River Trail with mountain bikers. Other trails along the East Fork also offer nice larch stands. 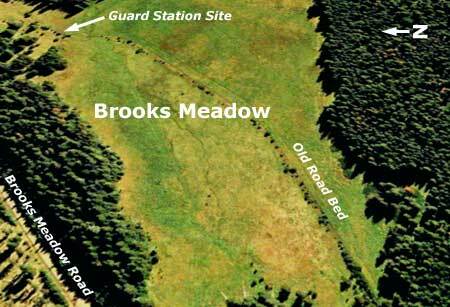 Brooks Meadow is one in a string of sunny meadows located on the gentle northern slopes of Lookout Mountain, just east of Mount Hood. At 35 acres, Brooks Meadow is among the largest, and has a long human history thanks to the water and forage it offers. It was likely visited for centuries by Native Americans, and in the late 1800s, was grazed with sheep following white settlement of the region. 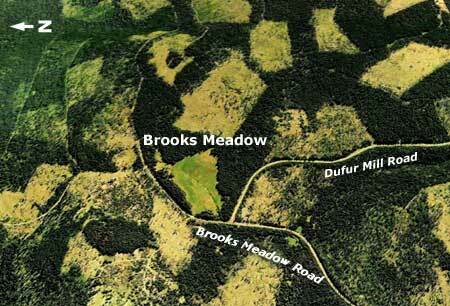 Early settlement trails in the area connected the dots between meadows and water sources, with several converging at the Brooks Meadow by the early 1900s. A guard station was constructed at the upper end at that time, near the junction of three trails at the north edge of the meadow. Later, the trails became primitive forest roads. By the 1950s, sheep and cattle grazing in the Lookout Mountain area was on the decline, giving way to a boom in commercial logging. Timber harvests focused on the big ponderosa and larch stands unique to the east slopes, and mills in the area thrived. The timber boom hit its peak in the 1980s, when miles of logging roads and hundreds of clearcuts transformed the slopes of Lookout Mountain. When the sawdust settled in the early 1990s, Brooks Meadow was somehow spared, a lush island in a forest that had been almost completely logged in all directions. By sheer luck, when the commercial logging boom swept the area, the old primitive road and trail system was mostly bypassed or destroyed by the modern, paved roads that carries logs to the mills. At Brooks Meadow, a new paved route was built around the north side of the meadow (shown above), bypassing the historic dirt track through the center of the meadow. The Dufur Mill Road was also paved, and routed just south of the meadow, proper. Thankfully, the relocated roads kept the steady stream of log trucks out of the meadow, and allowed the fragile ecosystem to survive the logging era relatively intact. In fact, the curtain of trees that was spared along the margins largely hides the meadow from today’s travelers, allowing Brooks Meadow to remain surprisingly unknown. When the paved roads were built, the primitive roads through the meadow were simply abandoned, and never properly decommissioned. In the intervening years, these abandoned roads have begun to reforest, thanks to the drainage that keeps the old roadbed drier than the surrounding meadow, and survivable for trees. A closer view (below) of Brooks Meadow shows the abandoned road, and the dotted line of young trees that have begun to grow along the old roadbed. The location of the former guard station that once stood here is also shown. Many of the meadows in the Mount Hood area are shrinking, thanks in part to a century of fire suppression and climate changes that allow for gradually encroaching forests. 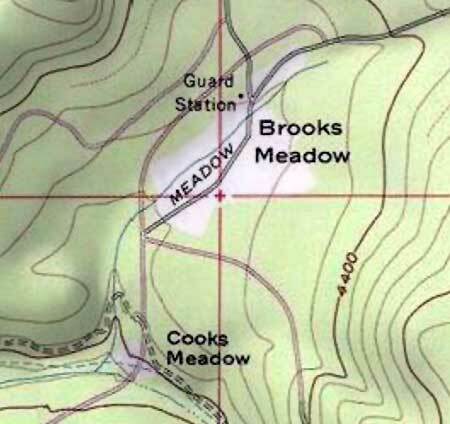 For Brooks Meadow, the threat comes from within, as well, with the strip of forest along the old road threatening to divide-and-conquer the meadow with reforestation. This doesn’t have to happen, of course. The purpose of this article is to prod the U.S. Forest Service to consider a brushing project to remove the young trees along the old roadbed, and perhaps consider changes to the road’s drainage features that would help the old roadbed blend into the meadow, once again. The brushing project is straightforward: there are about 60 young trees scattered along the old road, and they are small enough to removed by volunteers armed with bow saws and loppers. The drainage project would likely require more work, but could still be done by volunteers, assuming it is akin to trail maintenance work using hand tools. Here is my offer to the U.S. Forest Service: I will assemble work crews of 10-12 volunteers for the brushing and drainage work needed to save Brooks Meadow. I believe the brushing could be done in a single day, and the drainage work in 2-3 volunteer days. Let’s get it done – we just need the green light from you! The best time to visit Brooks Meadow is in June and early July, when the wildflowers are at their best. In many spots, the flowers are waist-deep, and you will be surrounded by the sound of buzzing bees, singing birds and perhaps even spot elk or deer. There is no formal trail, but the going is easy if you follow the tree line along the edges of the meadow. The route begins at the pullout “trailhead” at the west end of the meadow (see driving instructions, below). The best way to tour the meadow is clockwise from the pullout, following just inside the treeline. This will keep your feet fairly dry, and protect the most pristine inner portions of the meadow from human traffic. In the clockwise loop around the meadow, you will be rewarded with mountain views from the upper end, and huge drifts of wildflowers in early summer. Autumn is also a beautiful time to visit the meadow, though you should wear hunters colors whenever hiking on the east side in fall. In morning and evening, there are often elk and deer browsing in the meadow. Be forewarned not to approach elk herds — simply enjoy them from a distance. One uncommon plant to look for in the meadow is Agoseris elata, or tall agoseris. This plant is in the sunflower family, and looks a bit like a dandelion blossom on steroids. Agoseris elata grows in just two places in the entire Mount Hood National Forest — Brooks Meadow and nearby Bottle Prairie. 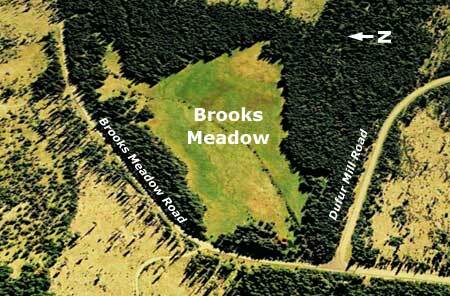 Brooks Meadow is located just off Forest Road 44, east of Mount Hood. Follow Oregon 35 from either Hood River or US 26 to the Forest Road 44 junction. Turn east, and follow Road 44 uphilll for several miles to the obvious intersection with Forest Road 17, where Forest Road 44 abruptly turns right. Continue straight at this intersection, onto Road 17, and immediately watch for a pullout just 100 yards from the intersection. 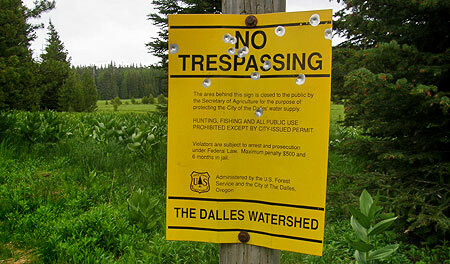 After publishing this article, I noticed that the Forest Service and City of The Dalles have been busy posting the boundaries of The Dalles Water Watershed, again, including the informal trailhead at Brooks Meadow. It’s a bit hard to take the closure seriously (most don’t, actually), given how the agencies have carved up this once pristine area with miles of logging roads and hundreds of clearcuts. More absurd is the fact that the “protected” stream flowing from the meadow is soon piped under paved Brooks Meadow Road in an open culvert — apparently, an area where protection isn’t required. Beer cans tossed in the culvert from passing pickup trucks complete this ironic picture. So, use your judgment in visiting Brooks Meadow. While it’s hard to believe that hikers visiting the meadow to appreciate its beauty would actually be prosecuted (and spend the advertised six months in jail and a $500 fine, no less!) the posted closure is for real, unfortunately.